Ever hear the term “office family”? You’re about to join one, so you’d better find out if you’re going to love them—or want to leave them. Work culture is at the heart of what determines whether or not you love your job. You eat with your co-workers, spend early mornings and late nights together, celebrate, gossip—even argue sometimes. If you’re not family, you’re basically roommates, right? And just like you wouldn’t want to share space with someone who cranks death metal until 2 a.m. when you’re a light sleeper, you don’t want to work with people who aren’t on your wavelength either—not if you can help it. 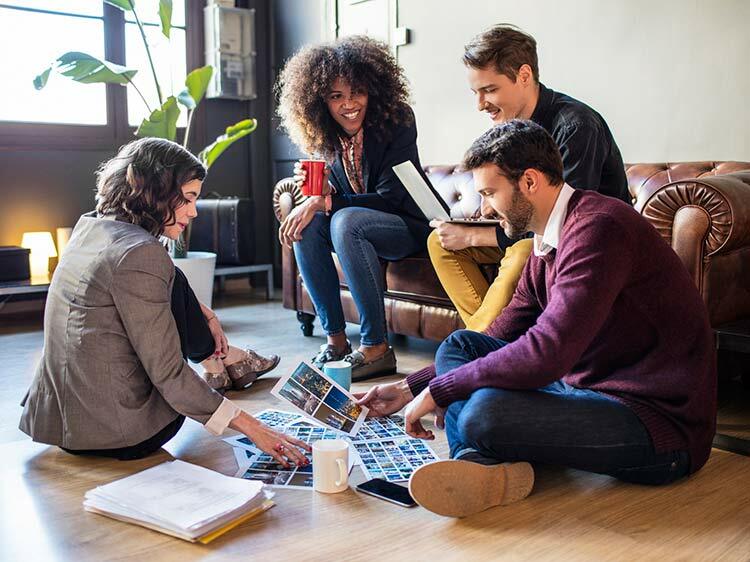 No one can give you a crystal ball to predict your future happiness at a particular company, but there are some ways to get a sense of what the people, the work-life balance, and the day-to-day will be like at your new home away from home. We spoke with career experts and hiring managers to find out some of the best questions you should ask during the interview process in order to get a sense of the work culture you’ll be walking into. It’s the kind of research that could make the difference between loving—and loathing—what you do from 9 to 5. This first question isn’t one that you ask during the interview, but one you should ask yourself during your interview prep. As you do your research and find out as much about the company's work culture as possible—including reading employee reviews—read what the company has to say for itself, either on the company’s website, or their company page on Kununu. Check out the job description too. Some are written in a way that makes you say “Yes, that’s me!,” but other times, you could read a job description and just not feel it. If you’re a bonafide introvert and the description says, “Are you a dynamic go-getter who loves meeting hundreds of new people every day?” you might want to skip that one. You’re going to be spending a lot of time with the people you end up working with, even outside of normal work hours, at conferences, celebrations, networking, etc. Getting a sense of what they do in their downtime could give you a sense of what they’re like while on the clock. And remember: You’re interviewing them as much as they’re interviewing you, so it’s OK to ask a few things about their likes and dislikes, and some of their habits. By seeing how people like to spend their free time, you’ll get a sense of whether you’ll be working with like-minded people or not. For instance, if you’re single and live in the city, but everyone you interview with is married with kids in the suburbs, you may quickly realize that you won’t have a lot in common with your colleagues—and therefore might not find it easy to make work friends. On the other hand, if you’re an avid cyclist and learn that your co-workers not only like to cycle, but there’s a company team, that could add another plus to your list of pros and cons when deciding whether or not to take the job. And you’d never know if you hadn’t asked. This question plays into people’s pride of their company, which can be strategic when asking about work culture. If someone can answer quickly with things they love, it shows they’ve got genuine love for their job (or at least strong like). Similarly, it’s actually a good idea to ask the opposite of this question, too: “If you could change two things about the company, what topics would you tackle?” recommends Leigh Steere, co-founder, Managing People Better in Boulder, Colorado. But only ask this question if you’ve asked about that person’s favorite aspects of working at the company—that way it’s a natural counterpart and not taken out of context. You might have the urge to ask about when people typically leave work, or if people are always stressed out at the company, but if you ask those questions you’re going to seem like you aren’t a hard worker. Instead, ask about the busiest time of year. Asking what people are allowed to wear to work can feel awkward, but you probably want to know the answer. A good strategy is to ask during the in-person interview, during the time (usually at the end) when the interviewer asks if you have any questions, if what the people are wearing that day in the office is typical. Granted, most employees you meet during the interview process will be on their best behavior, so be on the lookout for subtleties such as body language, tone of voice, and the energy level of the environment. Want to know other ways to determine whether or not a company is right for you? Join Monster for free today. As a member, you'll get interview insights, lists of great companies to work for, and career advice sent directly to your inbox. We'll show you how to take the guesswork out of the job search so you wind up with a company you love.